I recently noticed a small semi-circle on my upper leg that looked like a scratch. It just appeared out of the blue and I was not sure what it was. When I asked my wife's opinion she said it might be ringworm. 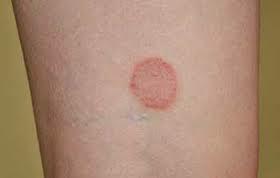 I looked up pictures of ringworm online and it looked similar to what was on my leg. The next day the semi-circle turned into a full circle and looked like I had been hit by a paintball. My heart sank since it appeared to be ringworm. My self esteem went down knowing I was afflicted with something with the name "worm" in it. I felt so dirty like maggots and worms were breeding in my skin. I did some extensive research (looked in Wikipedia) and was relieved to find out there are no actual worms in ringworm, it is actually a fungus. So the good news is I didn't have worms but the bad news is freaking fungus is growing on my skin! Learning of this was stressful for a person who showers at least once a day, wears clean clothes, and washes their hands regularly. What hygiene law had I violated in order to deserve this? I have since learned that ringworm is actually called tinea corporis.and is caused by dermoatophytes. I had athletes foot when I was a little kid which is a similar condition but I have not had to deal with anything like this since then. Ringworm is contagious and is usually picked up in locker rooms. Apparently it is very common among wrestlers. Side note- after learning about this and cauliflower ear, I am glad I was not a wrestler. On the bright side, I am grateful to have this just on my leg. After googling ringworm pictures I realized it could have been much worse. I've gotten over the original stigma from when I got the diagnosis. It doesn't bother me as much now, in fact, it's kind of growing on me. (Badum-ching.) I recently purchased some anti-fungal cream which appears to be helping. I am excited for it do go away so I can move back home from the leper colony.